Need help learning how to start a blog? 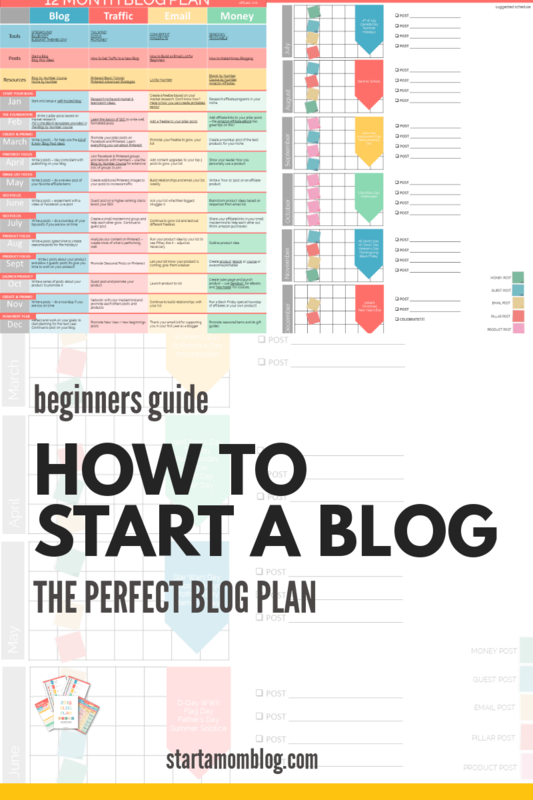 Here is a free blog planner used by thousands to start their own blogs! Do you ever wonder how you should write your first blog post? Wouldn’t it be nice to have a fill in the blank blog post template? Don’t worry! I’m here to help! In the video below I’ll show you exactly how to write your first blog post quickly following three simple steps. The method below is simple and will save you tons of time. You can also download the entire slide deck and free blog post template I share in the video. Enjoy! This 20 minute video shows you step by step how to write your first pillar blog post. At the end of this video you’ll be able to know how to research, outline and write your first blog post, or any of your future pillar posts! Let me know in the comments what you’re blogging about! I’m so happy to help you! Want to really grow your blog to a success? Need accountability and support? Join the Monthly Challenges here. Get a copy of the slide deck + the blog post template. 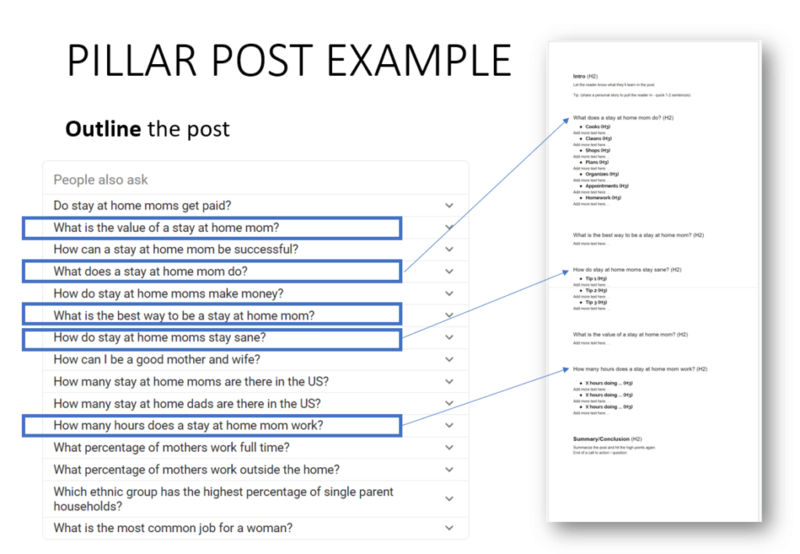 What is a Pillar Post and Why Should My First Blog Post Be One? Just as the pillars of a building help to hold it up, a pillar post helps hold up your blog. Instead of holding the roof up, a pillar post helps to form a strong foundation for your blog. Simply stated, a pillar post is a cornerstone piece of content. It covers basic questions such as the “what, why, and how” of a topic. It usually details steps on how to solve a problem and is super helpful and in-depth. The goal of a pillar post is to tell someone how to get from step A to step B to solve a problem. For example: How to have a natural birth. How Do I Write My First Blog Post? These all include researched keywords. Each of the first blog posts in the example targets the specific group of people that come to Momlifehappylife. They help to give them the resources that they need. Where Should I Write My First Blog Post? I write about 80% of the post on my google drive, and then I do the remaining 20% in WordPress. I interlink, add graphics, and generally polish it up in WordPress. Most of the actual writing takes place on my google drive since I can access it from anywhere. The headlines and formatting transfers with a copy/paste action. Let’s go through step by step how to write your first blog post. I will work the example with you as you do yours. First, take your keyword and plug it into a google search. 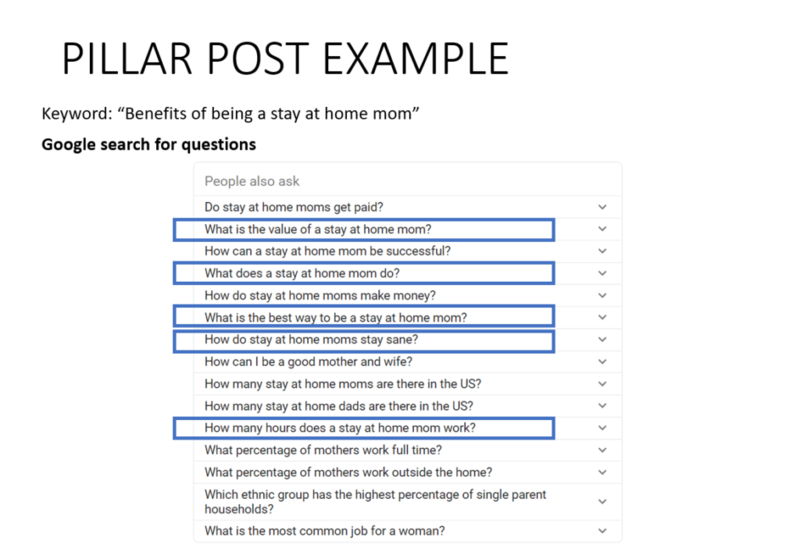 For our example, I’ll plug in “Benefits of being a stay at home mom.” Pay attention to the questions that google brings up. Highlight the questions that work well with your blog post. Some questions will be relevant, others not so much. Keep the relevant ones to answer in your first blog post. These are the problems that people interested in your topic have. For you – they are gold nuggets because they tell you what problems that you need to solve for your audience. You can see me go through the whole process starting at the 7:02 mark in the video. Sometimes Google does not show enough relevant questions. In this case, start clicking on the most relevant questions you see to make more come up. What Are the Benefits of Using Google Questions as my H2 Headings in my First Blog Post? By using the Google questions as your H2 headings, it gives you more content ideas to write about in the future. You could turn any of the H2 headings into its own separate post that goes into more detail. That way you can link back to your pillar post that you wrote for your first blog post. Using the Google questions in your first blog post helps it rank better. (The blogging industry refers to this as SEO which is search engine optimization.) Even if you have a new blog or a small blog, it is possible for your posts to rank on the first page of google. Such is the case with our benefits of being a stay at home mom post. Your intro will be the first thing that you write. It will have an H2, which stands for “Heading 2” You can select this with the drop-down menu on the top left of google docs. Let your reader know what they will be learning in the post and how it will help them. A pro tip is to share a little personal story of yourself in 1-2 sentences. This helps you to connect with your reader and pulls them in. Your Google questions go in H2 headings underneath your intro. Organize them in an order that makes sense to you and your reader. Then go through every H2 and see where you can add bullet points. Make the bullet points H3 headlines, so that you can add text underneath. Your summary/conclusion will also be an H2 heading. Highlight the main points again. End it with a call to action or question that asks for your reader’s advice/opinion. This helps you to get engagement on your blog post which helps with your Google rankings. This formula enables you to write 2,000-3,000 word posts that solve your readers’ problem and give in-depth answers. Now that you have an outline, you can start writing your first blog post. Since you are going for a meaty post of 1,000 to 2,000 words or more, what do you do if you still don’t have enough content after you have answered all the google questions? If you are still needing additional content, you can also ask experts in your niche. You can ask for other people’s quotes and link to them from your pillar post. Think outside the box. Who else can help you contribute to this post if you don’t have all the knowledge? Another great tip is to look at the other posts ranking on page one of the google search and ask yourself if you can write something better. Also, look at the top 2-5 posts and see how meaty they are. How in-depth does their content go? About how many words are there? That’s your competition. Your article will have to be better than theirs to rank on page 1. The Last Step For Writing Your First Blog Post – Sharing! Now that you have an amazing pillar post written and polished up, it’s time to publish and share it! For fastest results, you will need to use those multiple pin images to share on Pinterest. You should also share your post on Facebook, Instagram, and your email list. SEO is a long-term game, so have patience if you just started. 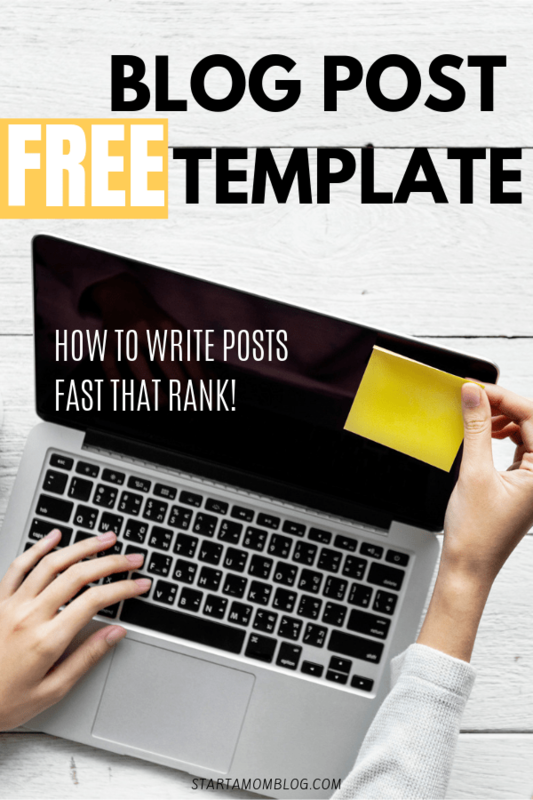 Using my blog post template with well-researched keywords will give you the very best chance of ranking on the coveted first page of Google. Now you know how to research, outline, and write your first blog post, or any of your future pillar posts! It starts with a simple google search and using the questions to make an outline. Your google questions should be H2s, and bullet points underneath should be H3s. Then, you simply fill in your outline with text to write your first blog post. The last steps are polishing it up, publishing and sharing. Let me know in the comments what you’re blogging about! I’m so happy to help you! Have You Written Your First Blog Post? You can use the method above for your first blog post, or your 50th blog post. It’s the method I use today, and I’m on blog post #105. Is this challenge new for 2019? Thank you so much for sharing your valuable knowledge! I’m so glad I decided to follow you as a mentor for finally starting my own blog 🙂 I’m already signed up for the February challenge and I have 1 post completed (besides a few edits) and am almost finished with the second. My question is if we already published it to our blog can we still submit it to you? I haven’t launched yet but I did publish it on the 8th I believe. For the February Challenge it had to be published in February 🙂 Hope to see you in the March challenge! Awesome, awesome tutorial. Thank you Suzi! I’m using these tips to go over some of my earlier posts as well to polish them up. Plus, these tips are really helpful going creating my posts for this month. Fyi, I love your colorful site :). Thank you so much Quinncere!! Super helpful! Makes me excited to get this started! Whooo hooo! I’m excited for you!! Suzi! Thanks for this. I have had my pillar blog post (of course, didn’t know that was the term for it!) for weeks but it’s still sitting quietly, unpublished in a google docs file. I’ve been sooooo afraid to post it b/c well… it’s sharing myself! It’s personal! (Although written with intent to help readers in the same situation.) And what if people think I’m crazy or dumb or just find it completely uninteresting? I did FINALLY launch my blog last week putting up my first two posts and one guest post (YEA!) but the posts are more superficial (though hopefully still useful to my readers, of course.) This tutorial on a pillar post makes me realize it’s time to forge ahead with the bigger picture that sets the stage for why I’ve built my website and the share the story I want to share. And you’ve also made me realize how I need to break the content down (it’s about 1600 words) into more digestible chunks using subheadings, which I never would have thought of. So… THANK YOU!